[Jamestown, Saint Helena, seen from the sea in 1805]. [Place of production unknown, ca. 1815? after an 1806 print]. 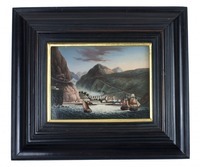 Oil painting on a thin brass plate (11.5 x 15.5 cm) showing the town of Jamestown on the island Saint Helena in the South Atlantic Ocean, with 2 ships and a smaller sailboat in the bay before the town, the fortress on the promontory to the left, the houses, governor's residence and church in the centre with the valley and mountains behind. 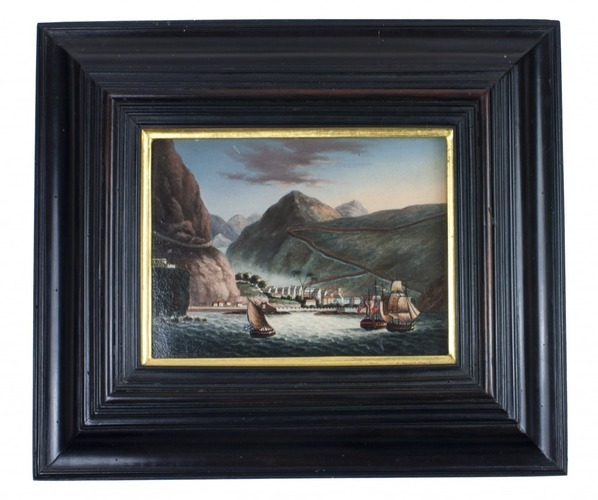 In an ebonized wooden frame and gilt inner frame (24 x 27.5 cm). An oil painting on brass, showing Jamestown on the island Saint Helena, with its houses, fortress, governor's residence and Church of St James, and with two ships and a boat in the bay before the city. Although the painting is unsigned and undated, it clearly matches the 4 June 1806 print published by Edward Orme in London, which was engraved by John Heaveside Clarke & J.R. Hamble after George Hutchins Bellasis (1788-1822). The interest in Saint Helena rose enormously when Napoleon was imprisoned there in 1815, so that is the most likely time for someone to have copied the 1806 print. Bellasis took a commission in the British army at Bombay, where his father was commander of the forces. Illness forced him to leave Bombay for home in 1804, but his condition worsened underway and he had to disembark at Saint Helena on 4 November 1804 and remain there eight months to recover before returning home. Bellasis was an amateur artist and when he recovered sufficiently, presumably in the new year, he made a series of views of the spectacular island almost 2000 kilometres from the nearest land. The print made from Bellasis's view of Jamestown, published on 4 June 1806, only months after he returned to England, is so close to the present painting that one must have copied the other. It seems most likely that the painting is a direct copy of the print. In very good condition, with only a few minor surface scratches in the varnish. A lovely painting of Saint Helena on brass, following a view made there in 1805.